Where would sci-fi be without big giant heads? 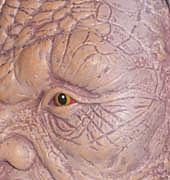 An impossibly old and wise being, the Face of Boe is the last of Boekind, rumoured to have lived for billions of years. He and the Doctor have met twice, on their second meeting the Face of Boe promised they would meet again, whereupon Boe would impart a final, great secret to a traveller who was also the last of his kind. When that third meeting occurs, Boe is using his life-force to keep the city of New New York powered and the Doctor must find a way to help his old friend survive. It must be said, the Face of Boe isn't the most dynamic of characters to appear on Doctor Who, but his enigmatic appearances outweigh the fact that he can't really, well, do anything. He mostly just trundles around in his giant life-support gizmo, and even talks telepathically rather than moving his mouth - the one time he truly speaks is the last, when (as prophesied) the sky cracks asunder as he dies, and his greatest secret is spoken. So as an action figure, there's not really a great deal of action going on - but he can trundle around and move his mouth occasionally, so they've got the necessary bases covered. 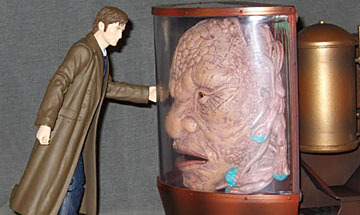 The Face of Boe isn't a "figure" in the standard definition - as a toy he's more akin to a vehicle. Naturally (as the name suggests) the focus is his face, a giant and ancient visage staring out from behind protective glass, skin wrinkled and pitted by the ages, surrounded by a mane of dreadlock-like tendrils and opaque spheres that look like some kind of esoteric sensory organs. The Face is a complex piece of work, comprising a flexible mask augmented by various sculpted add-ons protruding from beneath the surface, like the mass of tendrils and the eyes, which are separately painted and sit inside sockets, just like real ones. A subtle paint job of heavy highlighting over a dark base produces a weathered, rough texture, bringing out the considerable sculpted detail on the skin admirably. A darker red paint highlights the mouth, with black paint inside it - combined with the reflectivity of the glass shield - producing a convincing illusion of the depth of the mouth. Mind you, this isn't a picture-perfect replica. The paint picking out the sensory spheres, or whatever they are, is slopped on a bit, blending over the tips of the tendrils grasping them. There's also a pair of paint apps on the "wall" behind the Face, showing some kind of liquid leaking out of the life-support system - either a fault, since in the Face's final appearance things were a bit desperate, or part of its environmental system - and the white/green paint used here is quite bright, and stands out quite strongly against the brown plastic. The eyes aren't perfect either - their paintwork is adequate, but they lack a lifelike glossiness, and since they're separate pieces to the eye sockets they inhabit there's some variation from toy to toy in how well they fit. I picked the best available, but other Faces on sale appeared to be squinting in a rather harsh manner than didn't really fit with the Face's character on the show. The main problem, appearance-wise, is something that Character Options really don't have much control over - lighting. 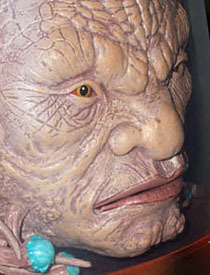 This is, give or take, what the Face of Boe prop looks like (it's not CGI, it's 100% physical), but under normal lights rather than the carefully controlled studio lighting its whole colour and texture seems different, and the different colours like the spheres and life support goop stand out a mile, where on screen they tend to blend in with their surroundings. It's a good replica, but short of installing its own lighting system, it'll never look just like it should. 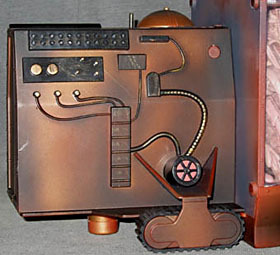 The toy, of course, includes the rear of the Face's life support machine, which was rarely focused on in the show, and thus can be a bit surprising in how big it is. 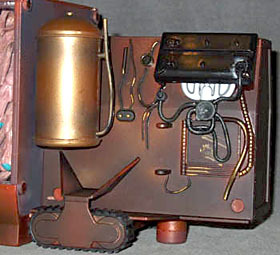 The main body of the machine extends back four and a half inches from the Face container, and is dotted with various contraptions, mostly with a kind of retro-steampunk look, all thick cables and valves, and one bit that looks like a boiler, of all things. The paintwork on the main chassis is smoothly blended from very dark brown up to a redder shade, but the gold highlight picking out many of the black components set into it is somewhat erratic in places. It works sufficiently well with the chaotic look of the system at a glance, but again, this isn't a masterpiece-quality replica. Locomotion is provided by a pair of tank treads, but they're just for show - the actual mobility comes from two wheels set in the bottom of the Face container, and a free-spinning ball bearing further back. The arrangement works pretty well, giving the Face a realistic trundling kind of motion when pushed. The action feature of the Face - indeed, pretty much the only feature - is the moving mouth, controlled by a lever built into the top of the rear chassis. The mouth is open by default; slide the control back, and the mouth will close, release it and a spring returns both lever and mouth to their original positions. The motion of the mouth is quite good, taking advantage of the flexible material of the Face to avoid any kind of articulation seams - it simply moves like a regular mouth. 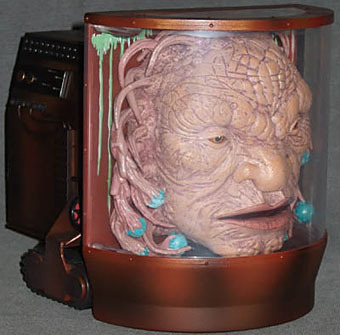 This is really one for the Doctor Who enthusiast - it's not one of those toys that are cool in and of themselves, and any child who doesn't know about the Face of Boe will just be confused if given this. But if you do know, it's a pretty cool reproduction of him, and it'll look great among any Doctor Who collection.